Coil spacers come in various thickness for front and rear coil springs on most cars and trucks. Coil spacers allow shock absorbers to operate through their normal range for longer life and proper response ratios. Spacers restore car trim height for correct front end component relationships, and for improved ride and appearance. They improve stability. When installed in front, car height is raised approximately 2-1/2 to 3 times spacer thickness. Engine weight must be considered. Rear installation on housing raises vehicle approximately 1-1/4 to 1-1/2 times spacer thickness. These spacers are made of aluminum and include one per package. Proper alignment is impossible unless coil springs are operating at originally designed height. Sometimes the front stabilizer may rub against the spring well housing. 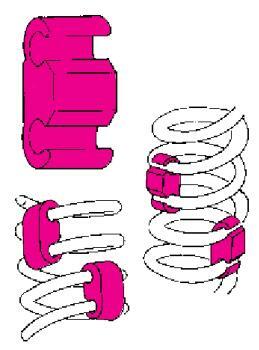 If this situation occurs, the stabilizer must be installed from the inside of the coil springs. Two sizes of short-nosed stabilizers are available: 24701 (a “short-nosed” 24700); 24751 (a “short-nosed” 24750). Two stabilizers are recommended per coil spring (no more, no less). 4 per pack. Due to the curvature of some springs, two sizes may be required for the same spring (Example: 24700 on inside of coil, 24750 on outside). When measuring and installing stabilizers, one space should be skipped between coils.